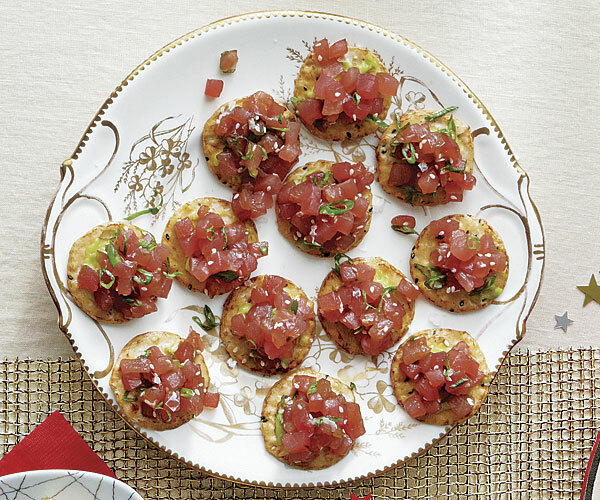 Lighter than sushi, this hors d’oeuvre features the delicious contrast between silky raw tuna and crunchy rice crackers. For color contrast, the brown rice crackers make a dramatic statement. You can find wasabi paste at the sushi counter of your local supermarket. Partially freezing your tuna will make it easier to get that very small dice. This recipe makes about 24 rounds. Adapted from those wonderful folks over at Fine Cooking, this recipe was one we demoed at Brookside Gardens December 6, 2013. Use a very sharp knife to cut the tuna into ¼-inch dice. Toss the tuna with the scallions, soy sauce, sesame oil, and sesame seeds. Smear rice crackers with cream cheese and top with a tiny dab of wasabi paste. Mound 1 packed tablespoon of the tuna tartare on each cracker. Press it down and sprinkle each lightly with sea salt (optional) and serve. This entry was posted in Appetizers, Recipes, Recipes from Adrienne's pantry and tagged fish, rice crackers, seafood, tuna, wasabi. Bookmark the permalink.